Before: Plucked from the palm, a raw coconut. 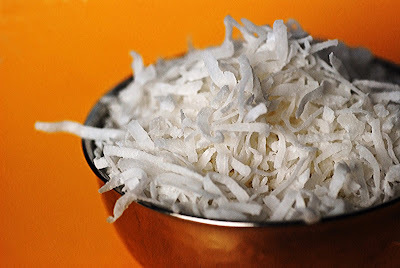 During: Shredded coconut, plucked from the grocer's shelf. After: The sweetest, buttery blond fudge, plucked from the pan. This post is being sent to Jyothsna, hosting January's RCI (Regional Cuisines of India) featuring the cooking of Kerala. 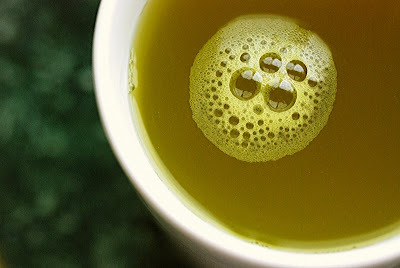 Did you know that green tea is one of the most healthful beverages on the planet? Did you know that studies have shown that green tea is bursting with serious anti-oxidants that are proven champions in the fight against many of the ailments and diseases that typically afflict us? Did you know that for all its health-enhancing qualities that it has no calories and a fairly low caffeine content? 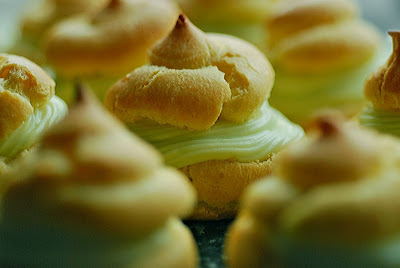 And did you know that I blew out all the benefits of this powerhouse plant by baking up a batch of cream puffs with it? My day did not start out so recklessly. I had the very best intentions. After a luxurious and desperately needed nine hours of sleep, I woke early with the idea that I would tap a teaspoon of green tea powder into a cup of hot water for a refreshing, cleansing tonic. While I do enjoy genmaicha prepared from bags or loose leaves, I had not found a high quality powder until a few weeks ago. Not that I wasn’t looking. I vividly remembered the sacred experience of one perfect scoop of matcha ice cream I’d had at a Japanese restaurant several months ago. As dense and crystal-free as gelato and as verdantly hued as a weathered park bench, it was impossible to disrespect the darkly earthy flavor by savaging the whole thing in one mouthful. It required a ritual as disciplined as chanoyu, a slow sculpting away at the clay sphere with the very edge of a small, carefully poised spoon. A very concentrated powder, I was told by my dining companion, was the prerequisite to making this exquisite treat at home. A very concentrated powder is what I held in my hand this morning. I froze on the spot. Suddenly, the cup of hot water was looking pretty dull and uninviting. Not like a sweet, not like ice cream. Ice cream for breakfast, how decadent can you get? Even I, with a voracious sweet tooth, felt a flicker of shame at the idea. No, it had to be something indulgent that I could pass off as breakfast, even though it wasn’t exactly traditional. After all, millions reach for donuts and Danishes with their morning coffee every day. I absentminded cruised the interiors of my fridge, looking for that intangibly perfect something I knew was hidden in there. It was: a tub of mascarpone with an expiration date still a month away. Wheels were turning, now; there was no turning back. I Googled green tea, I Googled mascarpone, I Googled myself into a frenzy, right into a green tea tiramisu recipe*, the epitome of fashionable fusion. Without any ladyfingers in the cupboard, I needed a fast and light foundation to hold the thick, rich cream. 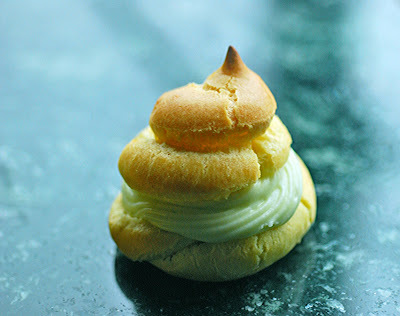 I leaned into the fusion and went to France, to a foolproof pâte à choux. Foolish I felt, too. An hour later, I sheepishly eyed a platter cluttered with adorable little cream puffs. I really did have the best intentions. The pastries were among the most finely flavored and textured desserts I had had in a long time. I washed down my guilt with the biggest mug of green tea I could brew. This post is being submitted to Rinku of Cooking in Westchester, hosting Weekend Herb Blogging for Kalyn Denny of Kalyn's Kitchen, the creator of this popular weekly food blogging event. 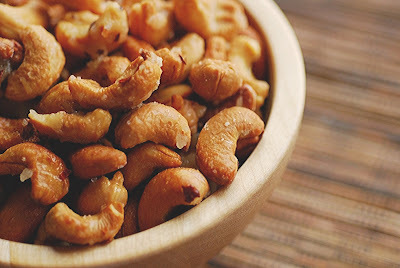 Arrange the cashews in a single layer on an ungreased cookie sheet. Toast them in a 350 degree F pre-heated oven for approximately 10 minutes or until light golden brown. Watch them carefully. Do not let them get overly browned; they will be further toasted during the glazing. Remove from oven and set aside to cool. After: Gently sweet, hot and golden. This post is being submitted to Mansi of Fun and Food, the host of Game Night Party, featuring easy vegetarian recipes to whip up for feeding the crowd in front of the set on February 3 or any other of your favorite sport spectators. Today, January 6, is National Bean Day. I have this on good authority, although based on my research thus far, no one can quite explain how this decidedly un-Hallmark holiday came to be. No matter. I’ve had beans on the brain for quite some time now. After the bacchanalian food feasts of December, a return, however briefly, to a healthier and more economical repast seems an appropriate way to fulfill an unspoken New Year’s resolution without the trauma and guilt of falling off a full-fledged commitment. 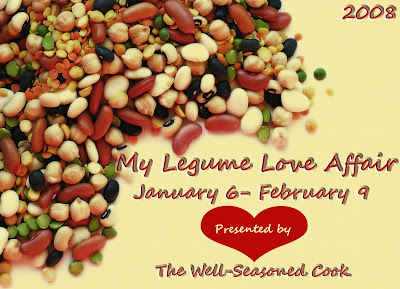 Legumes are consumed and revered in every culture that has the arable land to cultivate them on. 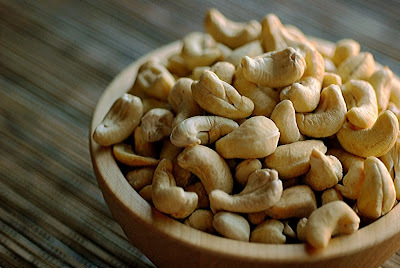 Chock full of protein, fiber, vitamins and minerals, they are one of the natural wonders of the plant kingdom and a staple where meat, fish or dairy are scarce. They are also the banner diet of many a staunch vegetarian and vegan, offering myriad options in flavor, shape, color and texture, fending off the notion that alternative lifestyles need be boring. While many are familiar with the virtues of chickpeas, lentils, kidney beans, black-eyed peas and limas, there are countless other varieties just ripe for the picking, many relatively easy to find on your grocer’s shelves, and all lending themselves to a wide range of dishes, savory to sweet, covering any meal or course. - Non bloggers: You are welcome to submit a recipe. Please send your name, location, recipe and an optional photo. I will include you in the round-up. - PLEASE NOTE: Meat, fish and diary ARE all permissible as long as your chosen legume is the predominant ingredient in your dish. Any course is welcome (salads, starters, sandwiches, soups, entrées, AND desserts), prepared any way you like. - While I can run a page translation program covering some languages for submissions by non-English participants, please at minimum offer an introduction to your recipe in English so that I can showcase it to the best advantage to the widest readership. Any questions, please contact me at the address above. So spill ‘em…the beans, that is! I look forward to your recipes. You can expect the round-up to be posted during the week of February 10. Latecomers will be accepted if time and workflow allow. Use of the logo is entirely optional. Many thanks for joining in! UPDATED January 28: Please note that this event is not a contest, but a gathering of many wonderful recipes from around the world. I would find it impossible to choose any one, or three, or ten recipes as the best when they are all genuinely first rate to me. Blogging is a strange animal. A blog can literally reach millions, yet it can also be a voice crying in the wilderness. When I launched The Well-Seasoned Cook in early 2007, I did not have a plan. What I did have was a curiosity and hankering for a new experience that would be both introspective and insular, yet foster community and camaraderie. What I got was much more than I could have anticipated, an ever-evolving arena to nurture a variety of creative arts that are dear to me and the delightful discovery that they are just as dear to many, many others. 2008 is gearing up to be an exciting year. Scott’s book will be published next month; I have a brand new baby who will challenge my assumptions about art and technology; and The Well-Seasoned Cook will celebrate its first anniversary in March. I still do not have a plan; I do not want one, lest it spoil the surprises. But even though I don’t know where it’s going, I do know where it has been. I also know that you have been there with me, too, and have tucked me in the deep pockets of your own travels as we share the ride and the meal. I thank you for your visits, whether you subscribe to my feed or are just passing through. 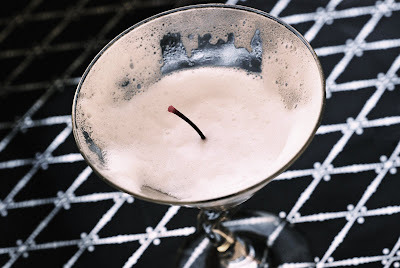 I heartily propose a shimmery froth of a toast. Get ready to clink your glasses. 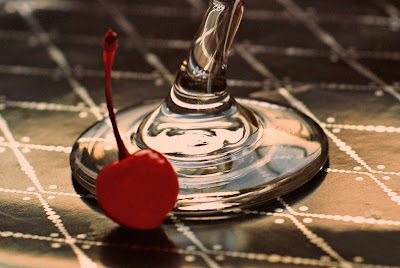 Here’s to all of you, to us…what was, what is, and what is yet to be. The world’s our oyster! Happy New Year, everyone! * N.B. - Though the risk is low, consuming raw egg products can potentially expose you to the salmonella bacteria. 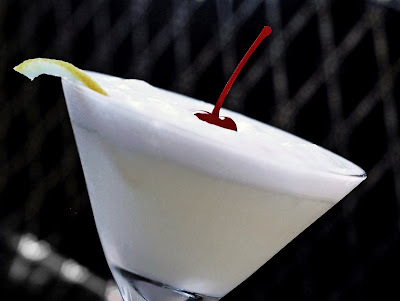 You can find pasteurized egg whites in the baking aisle of your supermarket. This post is being submitted to Bee and Jai of Jugalbandi, hosting the January Liquid Comfort theme of their monthly photography event, CLICK. Specifically, I am throwing the first photo into the ring for consideration.